One constant reality about living in the Valley of the Sun is heat. With temperatures rising above the triple digit level virtually every day between May and September, ensuring your house or business is cooled by the best air conditioning unit possible is a reality that virtually every individual must deal with. But, among the two leaders in this industry, Lennox AC Units vs Trane AC Units. which is the best? Both Lennox and Trane offer their customers huge selections of high-quality AC units to choose from that are tailor-made to provide the service you individually need. Whether you are trying to cool a two-bedroom condo. or a 6-bedroom home or multiple room office, it is important to find the right AC Unit that will meet your needs best. 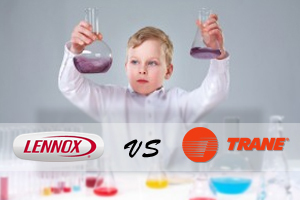 And each company, Trane and Lennox offer superior quality units for multiple applications. There are a total of (7) individual units available that are all Energy Star rated and have SEER Energy Ratings ranging from a low of 13 (for the Merit Series 13ACX Air Conditioning Unit) to a high of 21.2 (for the Dave Lennox Signature® Collection XC21 AC Unit). The Seasonal Energy Efficiency Ratio (SEER ) rating system was created by the United States Federal Government to provide consumers an easy and unified method of rating AC Units by terms of energy efficiency. Trane® has a tag line that states, It s hard to stop a Trane® meaning, their units are build to last (and are exceptionally quiet). The Trane Air Conditioning Company provides consumers a total of (8) individual residential AC Units to choose from. These units, classified by their XL, XB and XR classifications range in SEER ratings from a low of 13 (in the XB300 Series AC Unit) to a high of 20.0 (in the XL20i AC Unit sold by Trane®). Trane offers customers exceptional quality, at very good pricing – similar to Lennox in many categories as well. Trane® offers their customers a 60 day limited warranty on all AC Units they sell. The warranty covers any manufactures defects on parts for a total of 10-years; which include both the coil and compressor. This warranty does not cover these parts for standard wear and tear, and requires that they unit be registered via phone or online. Trane® will replace parts; however the cost of installation and other materials is not covered by the manufacture. Lennox on the other hand is a bit more extended on their warranty coverage. They offer a 10-year warranty on parts, the compressor and the limited lifetime warranty on the heat exchanger for the Dave Lennox Signature Collection AC Units. The Elite Series offers a 5-year warranty plan on parts; 10-years for heat exchange and 20-years or ‘limited lifetime’ for other parts. The Merit Series is similar to the Elite Series. Both companies offer extended services plans through authorized dealers who install Lennox and Trane AC Units. click the symbol at the bottom right to enable Full Screen mode. When choosing between each company, it is important to select the AC Unit that will fit your individual need best. As such, it is always advised to contact an authorized Trane or Scottsdale Lennox dealer and professional installation company who will provide expert advice and consultation for your AC Unit needs. To Get in touch with a certified Lennox Dealer in Scottsdale or Trane dealer in Scottsdale, we can help. Contact Scottsdale Air by calling 480-359-7141 today to get all of your questions answered, we are authorized Trane® and Lennox dealers. Contact the AC experts at Scottsdale Air Heating Cooling to replace your HVAC unit to keep your home cool. Email us or call 480-359-7141 now!